In celebrating Canadian Thanksgiving a week late, I always knew this would be a hard weekend food/ration wise. And yes, I slipped – badly – even though Canadians already received way more in rations than the Brits. 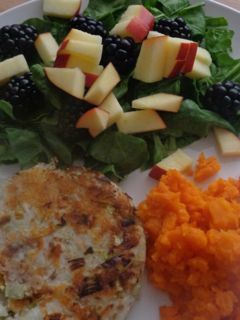 But, in getting back on track today, it got me thinking a lot about food. On the left hand side of the picture you can see my (British) wartime ration of 8 ozs of turkey meat to carry me through the week. On the right, in the brown bowl, the turkey leftovers my dog will be eating over the next few days in 2014. It makes me remember my parents’ (who lived through the war) frustration when I wouldn’t finish my meals as a child – Don’t you know there are people starving in other parts of the world? – and guilt at what I’m ‘wasting’ on an animal, even though she’s much beloved. Hmmmm. I really don’t think that we, in the west, who have the wherewithal, sometimes remember just how fortunate we are. 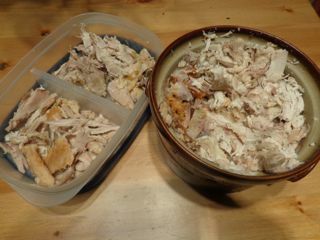 Given that we had turkey left over from our Thanksgiving meal, I’ve decided to use that as the basis for my meat ration this week even though I’m not sure how common turkey meat would have been in Britain during the war. 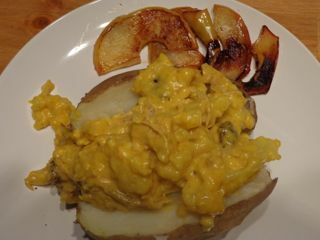 My experiment for tonight was full of good ideas, but didn’t quite make it in the execution: baked potato with a turkey, cauliflower, raisin curried white sauce, with fried apples on the side. It tasted ‘okay’, but I think that either a ‘regular’ curry sauce or one made with mayonnaise and curry powder might have tasted better. 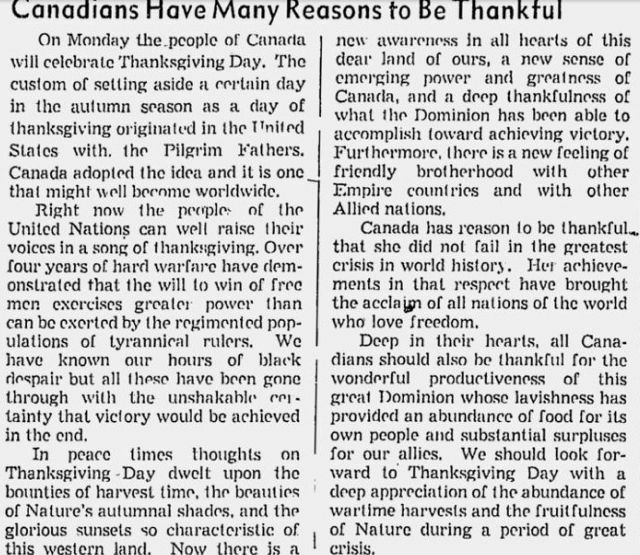 Canadian Thanksgiving in 1944 was celebrated on Monday, October 9th, 1944. The Calgary Herald was not issued that day, but here is the editorial from two days earlier. Happy (belated!) Canadian Thanksgiving to you all. It seems I’m doing a lot of ‘Eating At The Savoy’ this week, so dinner is taken care of tonight. That leaves lunch. 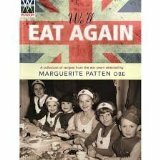 With cheese being so heavily rationed for my lunchtime sandwich, I’ve turned to Marguerite Patten’s book We’ll Eat Again for some different ideas. What do you think of her suggestions? 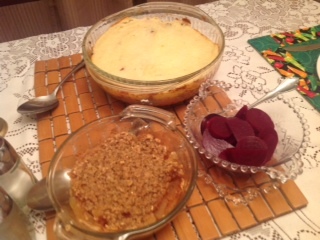 1) Shredded cheese and chutney or cooked beetroot. 2) Cooked mashed potato, yeast extract and chopped parsley. 3) Chopped grilled bacon and lettuce. 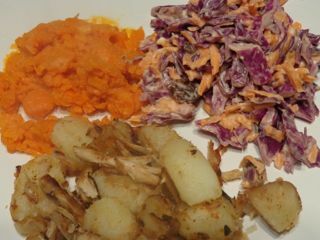 4) Mashed sardines, pilchards, herring or haddock, mixed with shredded fresh carrot. 5) Minced crisply cooked bacon rinds and toasted oatmeal. 6) Fish paste and chopped parsley. 7) Brawn, shredded swede and chutney. 8) Vegetable or meat extract and mustard and cress. 9) Chopped cold meat and mashed cooked vegetables with seasoning. 10) American sausage meats and watercress. I’m going to hedge my bets and have a cold sausage sandwich with my soup today. October 15th, 1944 was a Sunday, so I can’t find any links to any newspapers for that day. Instead, I checked out this great site which has a lot of information on Rationing in Canada during World War Two. Here are some of the main points from the article. 2) Promotion of ‘Patriotic Food’. 3) The launch of an unprecedented national nutritional campaign. 4) Controls on the price, production and distribution of everyday foods. Restaurants offered meatless Tuesday and Friday menus. Petrol/gasoline was rationed in April 1942. Alcohol was also rationed – but I couldn’t find a start date or amount for that. Two hundred cookbooks were published during the war years, and Canadians ate more, and better, than they had for over a decade. (The Great Depression.) Members of the RCAF received approximately 3,900 calories per day. What were the ‘Patriotic Foods’? Apples and lobster. Lobster! Canadians were encouraged to eat Lobster cocktail, Lobster a la King and Lobster sandwiches. After the Fall of France in May 1940, Canadian food exports became an essential lifeline to Britain. By the end of the war, Canadian exports accounted for 57% wheat and flour consumption in the UK, 39% of their bacon, 15% eggs, 24% cheese and 11% of their evaporated milk. Canadian housewives were encouraged to save fat and were reminded that one pound of fat supplied enough glycerine to fire 150 bullets from a Bren Gun. Two pounds supplied a burst of 20 cannon shells from a Spitfire or 10 anti-aircraft shells. Another great movie set on the Homefront in Canada (Alberta) during World War Two is Bye Bye Blues. Based on the true life experiences of the director’s mother during the war (she found work as a pianist/singer with a dance band to pay the bills when her husband was taken as a POW by the Japanese) it’s extremely hard to find, but well worth it! Toad-in-the-Hole tonight using one of my precious eggs for the batter. 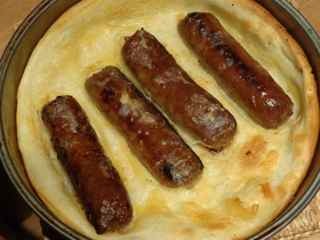 My Mum made the best Toad-in-the-Hole in the world, but sadly I don’t seem to have her knack. I followed the recipe precisely, used a hot oven and had the fat smoking before I added the batter, but although it tasted fine, it didn’t rise all light and fluffy the way my Mum’s used to. Ah well…I’ll blame it on cooking at altitude – Calgary is 3,400 feet above sea level. Anne shared a few of her thoughts about my experiment versus what it was really like to live under rationing. How did you feel about rationing? Often quite hungry. 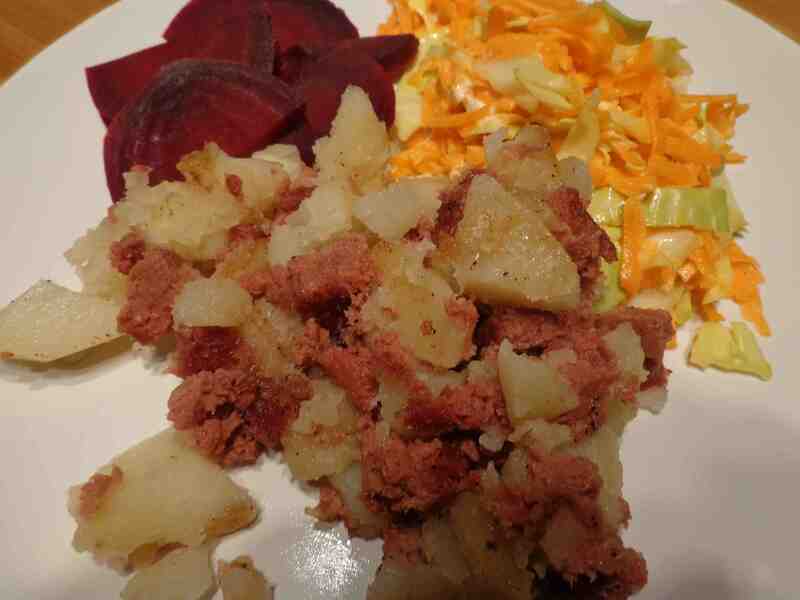 I’ve written more at length already (in an earlier blog) about school meals that were often just a pile of mash and a small piece of cheddar of slice of corned beef, with maybe a milk pud to follow. From your blog, I think, you are doing rather better although my memory of points is that we got 20 a month. Potatoes and bread were there to satisfy hunger, but dull fare when there was nothing to spread on them! Later, when I was working for the Daily Record I had the benefit of their canteen for a cooked supper – not brilliant, but food. I’ve been very fortunate in that I haven’t had any ‘shortages’ during my experiment. Yes, you have – we usually got eggs around Easter time but hardly any for the rest of the year, and then usually on ‘Blue Books only’ – children. Supplies of fresh stuff were still tied very much to the farming year. Many thanks to my writing friend Mahrie G. Reid for offering her perspective on Wartime Rationing from a Canadian point of view. Mahrie’s first mystery novel is scheduled for release this spring. If you would like to check out her website for more information, please click HERE. Thanks to Diana for inviting me to participate in her War Rations experiment. 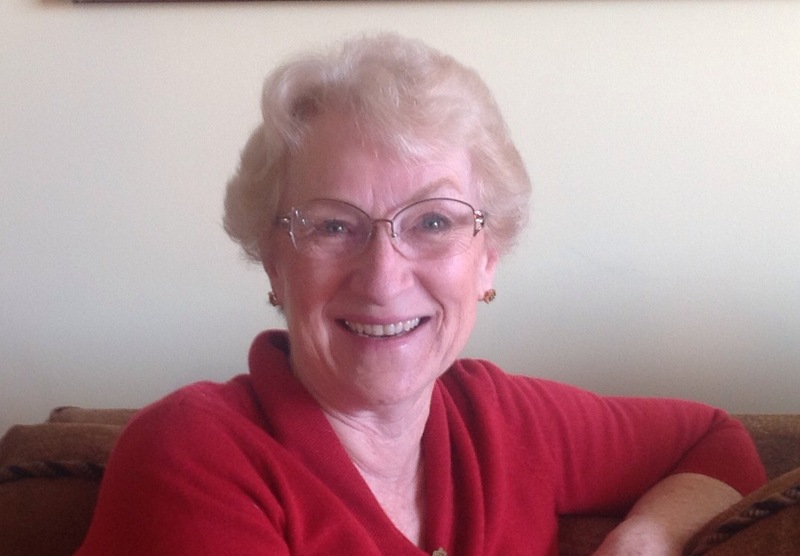 I was born in 1949 and many of the meals my mother served in my early years originated during the war rationing era. My mother, Mary Grace Ross, was born 101 years ago this month. The changes she saw in the world were astronomical. 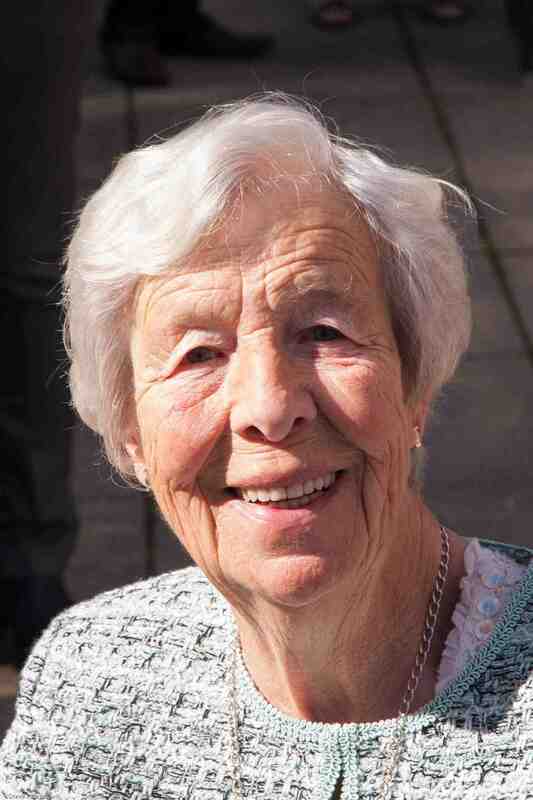 She lived 90 years and 10 months and had her life changed dramatically by two world wars. During WW ll her five brothers served overseas and Mom, who lived along the east coast, was a plane spotter, trained to identify every plane flying during that time and in particular enemy planes. Although sugar, tea, butter and meat were rationed, Canadians ate more and better than during the depression and the healthy eating guidelines used during the war are the foundation for the current Canada’s Food Guidelines. Canadians were encouraged to eat “patriotic” food, and apples and lobster were the first foods labelled as patriotic. Home canning was also encouraged and the process reached an all time high during the war years. The cheaper ground meat came into its own during the late forties. An episode of the Canadian TV show, Bomb Girls, realistically featured instructions on turning ground meat into a meal as tasty as steak. 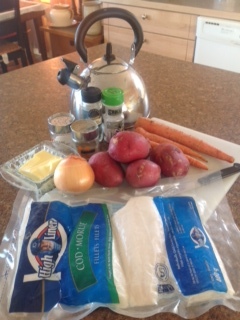 In Nova Scotia, fish was also a staple. Even after the war, these two items remained on the menu in our household. The meals I chose for my War Ration Day were Fish Soup (no milk so not chowder) and a no-crust version of meat pie topped with “icing” made of mashed potatoes. 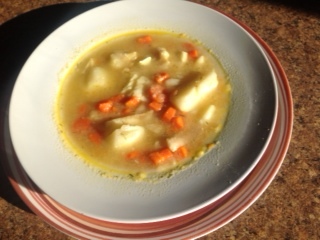 Both include potatoes, carrots and onions as well as a small amount of butter, salt and pepper. 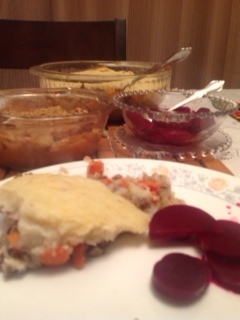 I added dried dill from a home garden to the cod-fish soup and served the meat pie with previously home-pickled beets.